It is Sunday and that means it is time to post some fun artwork using a CTMH product. 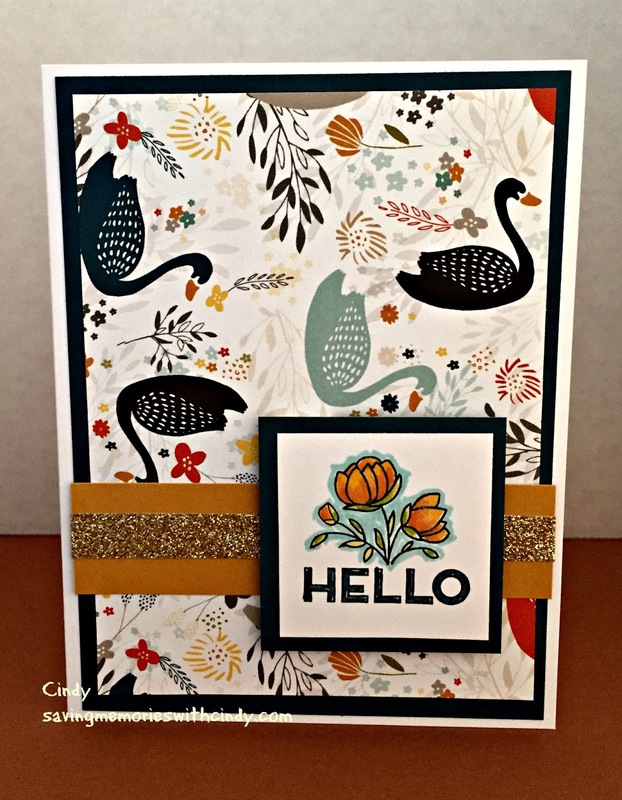 This month, my friend Karen and I have decided to highlight Swan Lake along with the Stamp of the Month for September called Blessed Beyond Measure. I wanted to show how the Swan Lake paper and the STOM could be used without adding the Fall pumpkin. Included in the stamp set are these fun leaves. I randomly stamped the leaves around the outer edges of my focal mat. I then added the berries that are also included in the stamp set. 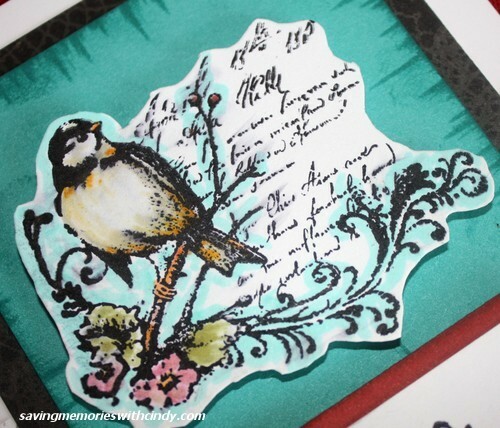 The sides are heavily sponged using Whisper and Fern ink. By the way, the paper on the left edge is the color Poppy (featured in the Swan Lake paper packet.) 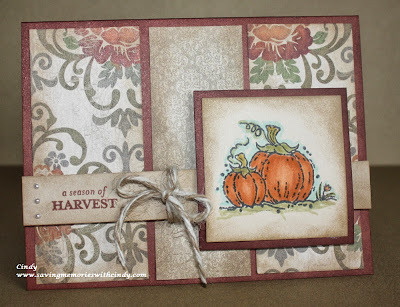 I embossed it using one of the new CTMH embossing folders called Wood Slats (Z3248.) I sanded it for extra texture. This month, Close To My Heart has a wonderful promotion to celebrate National Stamping Month. 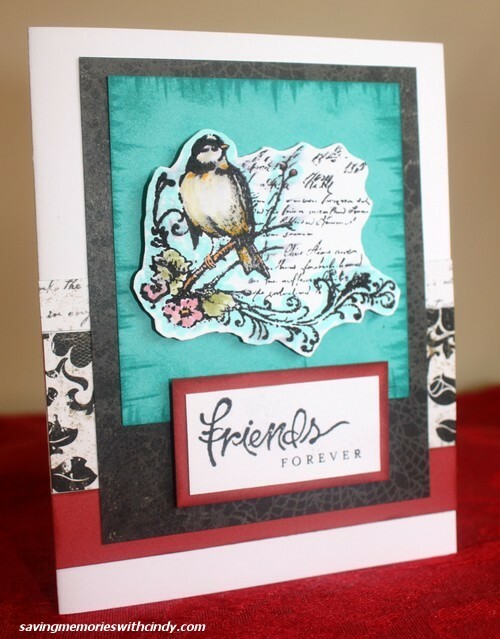 It is called Create Kindness and features a number of stamps along with cute 3 x 3 cards. Using one of the featured stamps and Swan Lake paper, I created this card. The stamp is only available during the month of September. It is totally handy image that will be usable for many different projects. A lined stamp, I colored it using my Shin Hann markers. 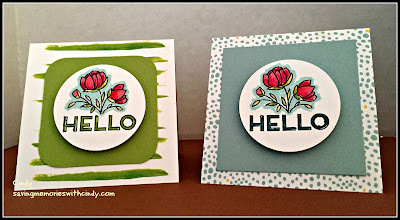 Last but not least, these are 2 of the cute little 3 x 3 inch cards that are included in the Create Kindness kit. For more details about the promotion, or to check out the Stamp of the Month and Swan Lake paper packet, stop by my website. Also, don't forget to check out Karen's Blog for samples of her artwork. For Now, Happy Crafting! If you’ve arrived here from Andrea's Blog, you are on the right track. Now without further ado, here is my project for the month. That sweet Momma Bunny is from one of my all time favorite CTMH Stamps called Sensational Season. It is a retired Stamp of the Month from a couple years ago. I love using it every year. Many of the other goodies on my project are new. The pattern paper is from the Skylark paper packet. 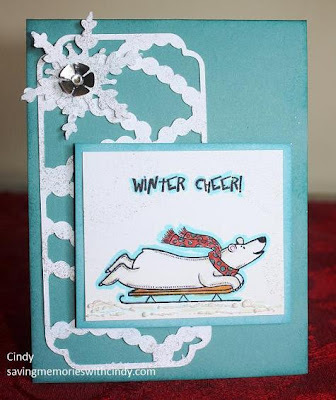 I added the teal shimmer tape and embossed and sanded the Lagoon base mat using the new CTMH Quarterfoil embossing folder. By the way, the image is colored with my CTMH alcohol markers. It is time to hop on over to Stephanie’s Blog. If you get lost along the way, head back to Joyce’s Blog for a full list of participants. For Now, Happy Crafting! Finally, I’ve gotten this card done. The components have been sitting on my desk for a week. Last week was nuts, I worked almost 30 hours at Mike’s and then had 4 classes in 7 days. Can you say pooped?!? Anyway, this card features Ariana…one of the new CTMH paper packets. I love it as it is so “spring.” It has such muted but pastel colors. By the way, if you live in the Mid-Atlantic States or the Northeast, are you ready for MORE snow tomorrow??? One of the main reasons I love Fabulous You is that it has so many creative options. You can stamp it and sponge around the edges for a great antique look. You can color it with your water color pencils or as I did in this case, color it with your CTMH markers. I also wanted to mention that I appreciate everyone’s patience with my lack of recent posts. In February, I experienced an unexpected life altering event. I am OK and slowly returning to a “new” normal. I am going to work very hard at resuming my creating and posting. Don’t forget to stop by my website to check out some of the great CTMH products. For Now, Happy Crafting! 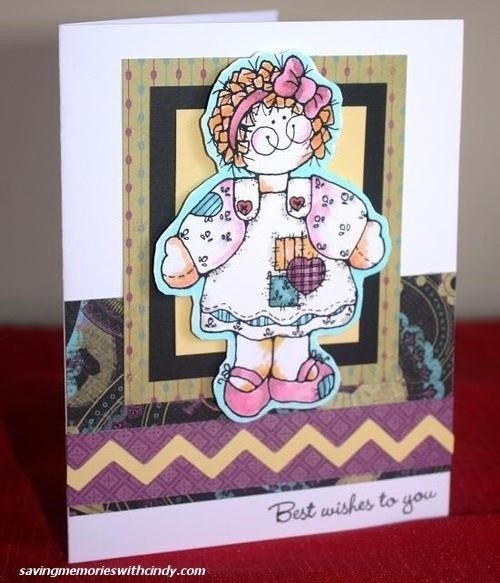 Lollydoodle is one of the fun new CTMH paper packets just released in the Spring/Summer Idea Book. It is bright, cheery and features Pear, Lagoon, Sky, Cotton Candy, Sorbet and Slate. With all of the nasty winter weather so many of us have been experiencing, you just have to love the spring colors. I think I’ve mentioned before that I love the Jeanette Archive stamps. This adorable little girl is from the Winter book but is still available. I stamped her using my Archival Black ink, colored her with my CTMH alcohol markers and then cut her out. I stamped the flowers that are included in the set along the bottom of the focal mat, colored them with the markers and sponged the background in sky to give the impression of sky and clouds. The sentiment is from one of the stamp sets included with the Artiste Cricut Cartridge. By the way, the centers of the flowers are the new Flamingo Dots….love them! For those of you stuck in the awful winter weather pattern, please be safe. I have a suggestion, spend you time at home being warm and creative. For Now, Happy Crafting! I am so excited about the upcoming CTMH Spring Summer Idea Book. My supplies are beginning to arrive at my doorstep and you will be able to begin to order the goodies beginning February 1st. One of the wonderful features that is continuing in this IB called Jeanette’s Stamp Archive. This is a collection of stamps created over the past 30 years by CTMH’s founder, Jeanette Lynton. This Idea Book has 4 new stamps. Each of them is cuter than the next. I’ve chosen one to complete a Valentine Card and that will give you a sneak peek at one of the many new items. The stamp is called “Coming Up Roses” (C1579.) While it does have the sentiment “Happy Valentine’s Day,” I think the cute cherubs and roses work year round for both scrapbook layouts and cards. I’ve colored them with my CTMH Alcohol Markers and used paper from the Chantilly (Z1814) paper packet. Chantilly will be retired effective January 31…right as the new IB becomes available. It is a terrific paper packet featuring bright and springy colors. Coming Up Roses is available February 1st. Stop by my website if you would like to order Chantilly before it’s gone. And, mark your calendar to stop by on February 1st to see the new CTMH Idea Book. For Now, Happy Crafting! 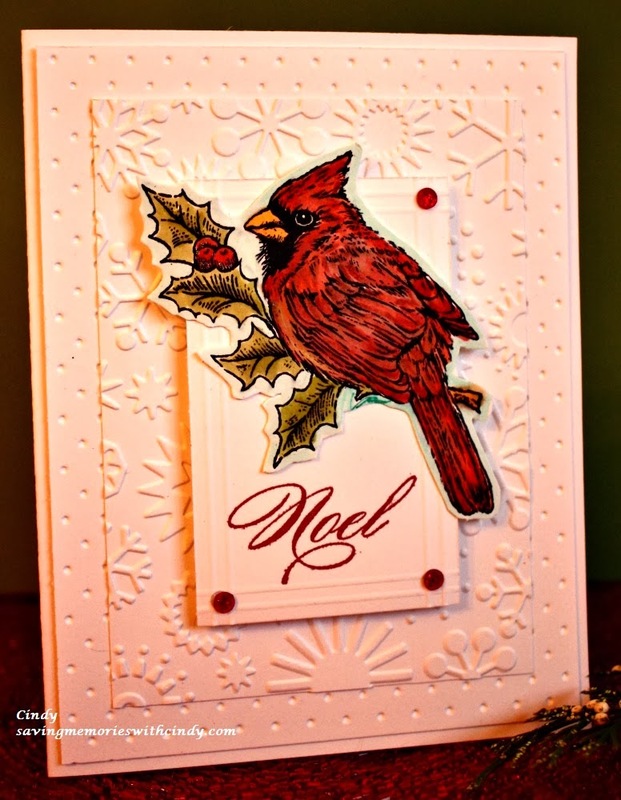 It is the cardinal from the "To You and Yours" set (B1403). This set was actually released last year and remains current. I loved it last year and I continue to love it. White on White is a challenge. When I was designing this card, I knew that I would have to come up with texture to show off the different mats. I used my Cuttlebug folders along with my scoreboard for the top mat to do this. 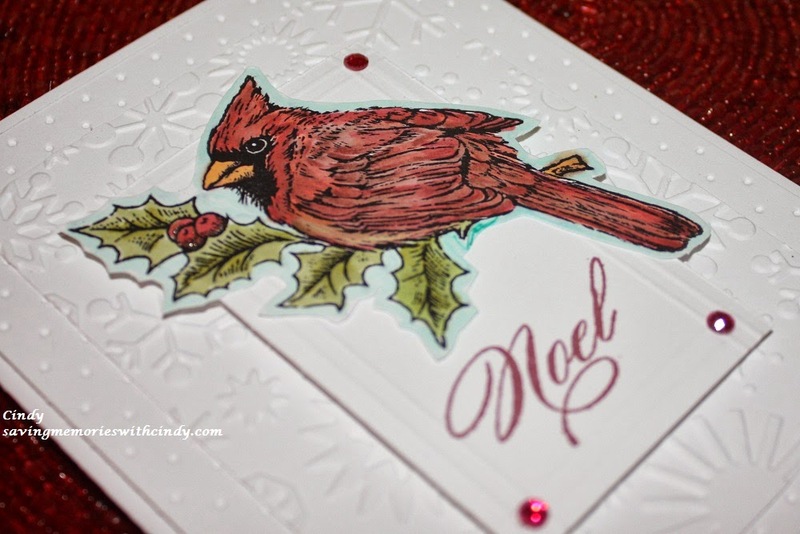 The cardinal was stamped using my CTMH Archival Black ink and colored with my CTMH alcohol markers. Just a tip... when you use the Archival Black ink for your markers please allow it to dry before you color the image. 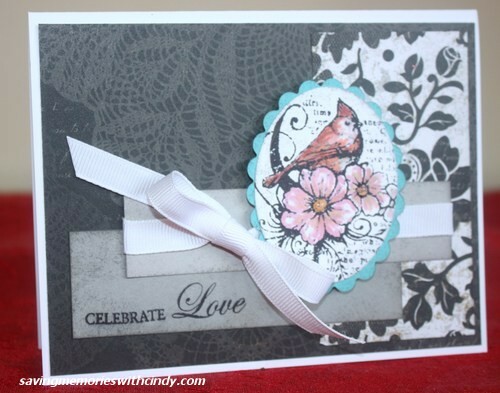 I usually will do my stamping and go off and prepare the rest of the card while the ink is setting. You could also use your heat gun to speed the process. The key is to ensure that the ink is dry to avoid smearing. Anyway, after the cardinal was colored, I cut it out before I attached it to the mats. I wanted to do that to enhance the texture of the card. I know that we are all busy right now, but take a few moments and check out the challenge on Crafting By Designs. Feel free to enter a card, too. I would love to see how you interpret the White on White challenge. For Now, Happy Crafting! There is just something I love about the CTMH Huntington paper packet. I've used it for multiple cards and for a Heritage Layout. It is vintage, fall and the gray paper mixed with black and white would be perfect for a wedding card. Today, I used it for its intended purpose...a fall card. 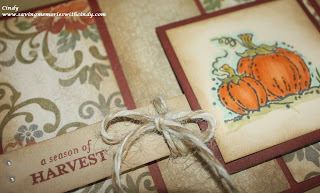 This card is for my upcoming October Crafting in the Country workshop. 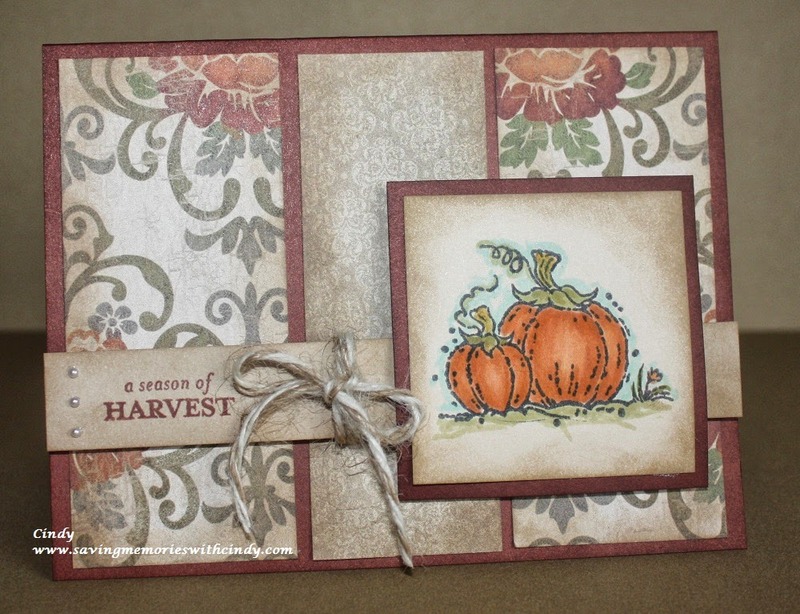 It uses the Perfect Fit Thanksgiving stamp set (B1427) for the sentiment and the pumpkins are from last year's September STOM. We had used that in last years October class. Each of my classes builds upon a previous class. We review techniques we've done in the past (in case some one new is joining us), sometimes use stamps from previous classes with new papers and always have a new technique. Last month, we did the Frosted Workshop on the Go, so I wanted to use one of the sketches we used from that class to show that a sketch works for multiple styles of cards. This card is done on an A2 base of Barn Red. The mats are sponged with Cashmere and the pumpkin has been stamped with Archival Black and colored with my CTMH Alcohol Markers. The card is also embellished with Bitty Pearls and hemp. So, remember, just because a paper or a sketch has been pictured using it is one set way, doesn't mean you can't change it up and call it your own. For Now, Happy Crafting! 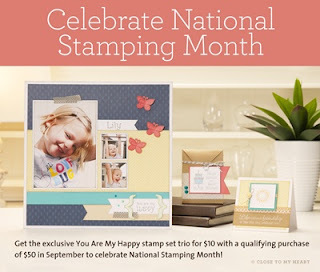 I haven't had a chance yet to share just that the CTMH National Stamping Month promotion is adorable. It contains 3 D sized stamps sets and you can get it for only $10 if you spend $50 on product on my website. What a deal! And, what makes it even better is one stamp set is cute little images, one set are wonderful sentiments usable for both scrapbooks or cards and the third is a very usable alphabet. I just think that this campaign is terrific and with all the goodies in the Idea Book, how can you go wrong? Don't forget to check out my website to get your own CTMH National Stamping Month Stamp Set. For Now, Happy Crafting! The New CTMH Idea Book is Here with a Give Away! It is finally the day to release the new Idea Book!!!!!!! Party Hardy everyone because this IB is probably the best one in ages! I love everything in it. There is a new Cricut Cartridge that is ground breaking. Literally, you no longer have to waste paper cutting images that don't fit on your project. Just set the Cricut on the size of your layout the the title, embellishments, overlays and photo mats cut perfectly. There are new wonderful papers, embellishments and stamps. I hardly know where to begin. Convention was a blast this year because of all of the excitement around the new products. Anyway, to celebrate the new Fall/Winter Idea Book, I'm doing a give away. Leave a comment on this or any future post through August 18th and you be entered into a random drawing to receive this wonderful retro stamp. Place an order on my website by joining in on the online party called Fall Winter Idea Book Party between today and August 18th and I'll send you a special treat along with two entries into the random drawing. Comment on my Facebook Page during the same dates and I'll also enter you into the drawing. Come party with me and celebrate the new Close To My Heart Fall Winter Idea Book. For Now, Happy Crafting! This is just another quick and simple sneak peek at another product to be released in the August 1st Fall/Winter Close To My Heart Idea Book. As usual, I have to run off to work in a little while and actually have a long day. After my floral shift, I have a paper-Ed class with 3 lovely ladies. I won't be home until the store closes. I was able to get this card done first thing this morning. OK, what are you seeing new here... :o) The pattern paper is from the upcoming paper packet called "Frosted." The minute I saw it I went nuts over it. Wait until you see more. It is terrific. The candle image and sentiment are also from one of the new My Acrylix sets, too. Love, Love, Love. When I first saw Frosted, I immediately thought of Ponderosa Pine card stock. CTMH does not feature it with this color, but I think it works. What do you think? That is the beauty of Frosted...so many possibilities. Getting excited about the new Idea Book? I sure am thrilled with it. Don't forget to keep checking back as August 1st draws near. By the way, don't forget that some old favorites will be discontinues effective July 31st, so if you are in need of any current supplies, stop by my website and get them before it is too late. For Now, Happy Crafting! Introducing CTMH Artbooking A Little Sneak Peek! Yesterday a box of Close To My Heart goodies arrived at on my doorstep! One of the best things in that big box with a plastic bag with the new Artbooking Cricut Cartridge. Available from my website on August 1st, this is just a little sneak peek at what you can do with it. It has been such a hot summer here in Philadelphia, that I thought it would be fun to make a winter card. Notice the lattice work mat? Well, that is one of the terrific features you can create using the new cartridge. Contained within the cartridge are countless overlays and scrapbook pages. The beauty of the cartridge is the programing...You select the size of the scrapbook album you wish to make and hit real dial size and everything on the key will fit. No more wasted paper or miscuts! WOW!!! You know how much time and money that will save? Now, this is a card you say, not a scrapbook page. Yes, it is! I didn't have time to create a layout, so I did a little figuring and converted one of the layout overlays into card size. Artbooking is not for scrapbooks alone. In the near future, I will post how I figured it out. In the mean time, a few more fun facts about this card...the snowflake was also cut using the Artbooking. That adorable polar bear is in one of the soon to be released stamp sets. He was stamped using the Archival Black ink and lightly colored with the CTMH Alcohol Markers. By the way, that is Prisma Glitter and Liquid Applique on the bottom to create the snow. Keep checking back before August 1st for more peeks at upcoming new CTMH products. When you purchase the new Artbooking Cartridge, remember, is works for both scrapbooks and cards. And, it is not always about the price...it is about the customer service and the friendships you build while using Close To My Heart products. For Now, Happy Crafting! 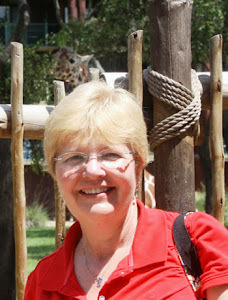 I was so excited when I saw Joyce at Convention and she asked me to join in on the Joyful Stars Blog Hop! Joyce and I are sort of neighbors...she doesn't live that far from where my Studio (the house that I grew up in) is located. It is so nice to know someone from my old stomping ground. Anyway, if you've arrived here from Jeanie's Blog you are on the right track. For my first post in the hop, I've completed a card featuring For Always (X7165B) and Fabulous You (C1533.) I stamped the main image with CTMH's archival black ink (44751) and colored it using several of our alcohol markers. I love our markers! I was able to finish a card before I ran off to work today! :o) I haven't played along with the Mojo Monday Sketch Challenge in quite awhile and this weeks sketch caught my eye. It went along perfectly with the For Always (X7165B) and Fabulous You (C1533) stamp set. I have always loved sketch challenges. I love to see how everyone makes the sketch their own. For this card, I used as I said For Always and the Fabulous You. 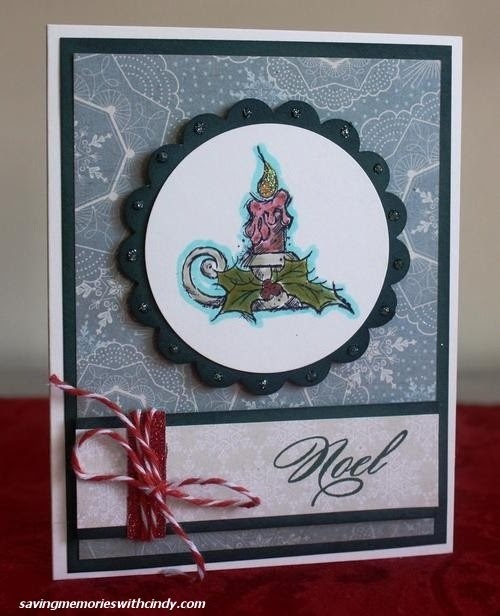 I also added a stamped sentiment for Lace Doily (B1418), Whisper, Slate and Lagoon card stock, and colored the main image with my CTMH alcohol markers. I love the markers. 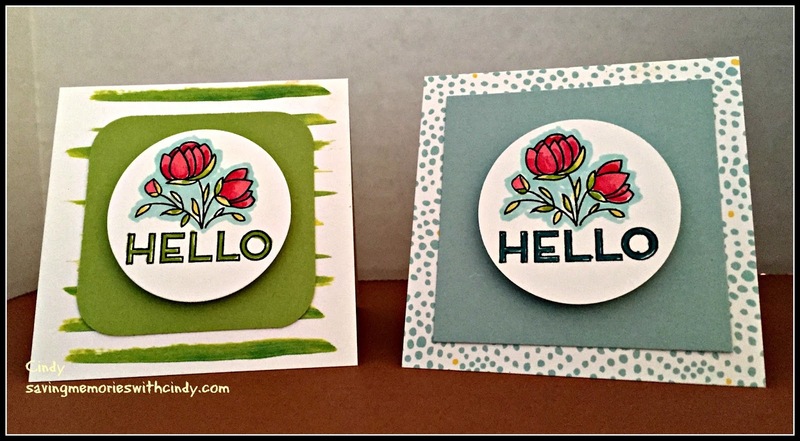 I really find them easy to use and for a full post on how to use them, head over to my older post on Papers Pads and Pictures. I enjoyed playing along with Mojo Monday Sketch Challenge and thank them for another great sketch. For Now, Happy Crafting!